This post orginally appeared in Fox News Latino. 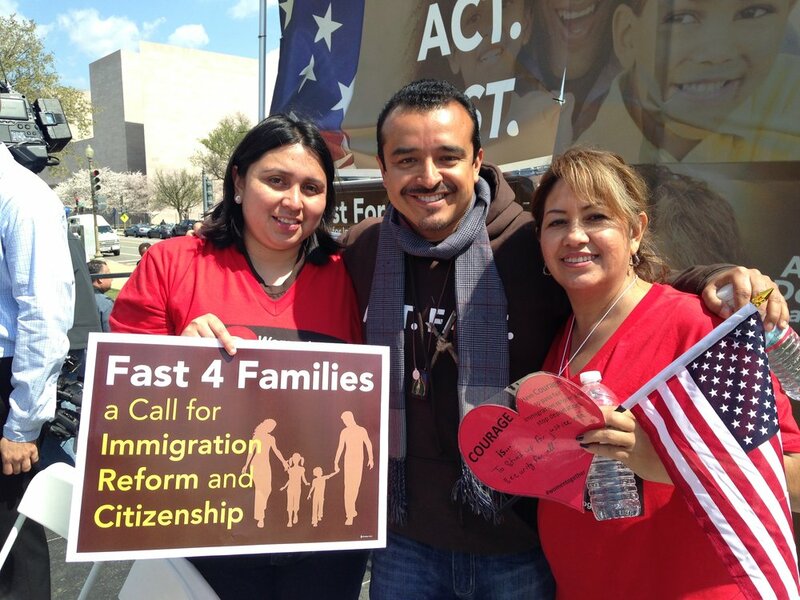 Rudy Lopez, Senior Organizer at the Fair Immigration Reform Movement, participated as a core faster in the Fast for Families: A Call for Immigration Reform & Citizenship, going without food for 22 days. Yesterday, Rudy wrapped up a six-week, cross-country bus tour with a rally on the National Mall in Washington, D.C. I am not an immigrant. I was born and raised in the small Midwestern town where I still live today. And though the undocumented experience is not my own, I grew up seeing first-hand the toll it takes on the human spirit to be separated from your family. Our house was a place where undocumented relatives would stay after they migrated to the United States for the first time. I watched members of my family live in fear, and I witnessed others treat them as second-class citizens. And because of our broken immigration system, I have experienced the tremendous grief of losing a loved one. In 2005, my cousin Martin died as he was attempting to cross the border in search of a better life. Martin became sick along the journey, and the Coyote, or human smuggler who was supposed to act as his guide, abandoned him. Martin died in the desert, cold, hungry and alone. I saw how this immense sorrow nearly broke my family. In the past few years, I have witnessed the roller coaster of the legislative process. Just as we start to gain real momentum and get closer than ever to a win, we seem to lose some of that momentum. And as a result, I’ve watched countless families grow hopeful that immigration reform will actually pass, only to have that hope crushed. It is discouraging. For all of us. But then I have to remember the other things I’ve seen. During the fast and the six-week bus tour, I’ve met so many people who share a common purpose and share so many values. These people firmly believe that migration makes this country better, and that embracing immigration reform means embracing our country’s heritage. The people that I’ve met along the way fight with everything they have. They bring unbelievable enthusiasm and energy to the movement. Along with the incredible amount of grief in the stories of innocent lives caught up in our broken system, I’ve encountered an equal amount of compassion, hope and commitment to continue fighting until we win. But of all the inspiring people I met along the way, perhaps the most powerful experience I had took place during my 22-day fast. It was just days before Christmas, and a group of young activists came to the Fast for Families tent to meet the fasters and tell their stories. Each of the children talked about what they wanted for Christmas and each child said the same thing—they just wanted their parents back. These kids, some as young as five years old, were orphans with parents. Their lives had been thrown upside-down when their mothers and fathers were taken from them by immigration enforcement officials. In their faces I could see palpable pain and confusion and grief. But at the same time, in spite of all of that, I could clearly see that they had hope that they were going to find a solution. These kids set an example for me. When I start to get discouraged, as so many of us do, I have to remember that it’s always darkest before the dawn. There’s going to be struggle. It’s going to be difficult getting there, but we’ve never come this far before. We’ve never had so much support across the board from all different sectors across this country—everyone is with us. We’re not going to allow a small group of people in one section of the government to stop what’s right for our families and our country. My favorite poet, Pablo Neruda, once wrote, “They can cut all the flowers, but they can’t stop the spring from coming.” To me, that is confirmation of what is to come—a select group of lawmakers can put up all of the roadblocks they want, but they cannot stop the inevitable. We will win immigration reform.